The Mystery of Inspiration or Is He Dead Yet? What is inspiration? We usually think of inspiration in reference to artistic genius, and there is certainly something to this. Yale University’s library houses a wonderful collection of original and rare manuscripts, including musical scores written by some of the world’s greatest composers. A musician friend who viewed the Yale collection tells me that the manuscripts of Beethoven look like the mad scribblings of a child with a Crayola crayon. Ludwig von Beethoven was apparently a very frustrated composer. I, too, would be frustrated if I had to deal with deafness. The scores of Johann Sebastian Bach, by contrast, are extremely neat, so much so that whenever Bach made an error, he crossed it out with a straight edge and neatly wrote in the correction. Bach’s musical manuscripts reveal a man who put considerable conscious thought into his compositions. American composer, pianist, and musicologist Robert Greenberg says that a Bach opus is much like a skeleton pocket watch. All the rich complexity is immediately and unmistakably obvious. Mozart’s manuscripts are a totally different story. Wolfgang Amadeus Mozart appears to have written his music at breakneck speed, using both his left and right hands simultaneously. The amazing thing about Mozart’s work, however, is that it is entirely flawless—not one cross-out or correction! Mozart used to say that he never really composed music but that he simply wrote down what he heard. The music of Mozart is undoubtedly inspired. Professor Greenberg likens it to a mechanical watch with a simple, elegant face. It’s got a nice clean design on the surface, but underneath it’s astonishingly complex. In other words, it’s easy to whistle or hum a Mozart melody. Mozart’s harmonies and rhythms, however, are so intricate that some scientists believe that listening to his music can actually lead to significant improvements in brain function. This has been popularly termed “the Mozart effect.” If you have your doubts, just remember what one of my seminary professors used to say: “A day without Mozart is like a day without sunshine.” So go ahead and play Eine Kleine Nachtmusik for your kids. It couldn’t hurt. In short, Beethoven, Bach, and Mozart all produced inspired music. There is, to be sure, something heavenly about their compositions. Yet each musician was a unique individual, and this uniqueness manifests itself in each man’s work. I say all this simply to demonstrate that inspiration is a mysterious matter. This is no truer than when it comes to biblical inspiration. 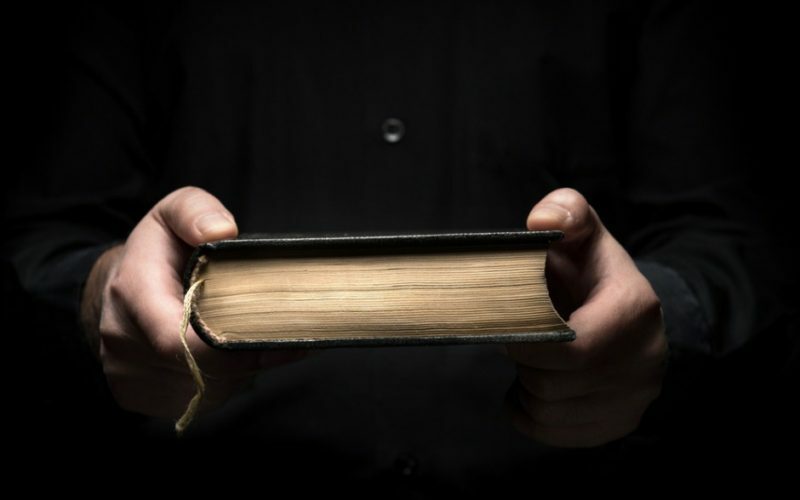 What does the Church have to say about the Bible being inspired? In 1870, the First Vatican Council taught in its Dogmatic Constitution on the Catholic Faith (known by the Latin title Dei Filius) that the books of the Bible are “sacred and canonical …because, having been written by the inspiration of the Holy Spirit, they have God for their author and have been delivered as such to the Church herself.” How did God manage to inspire the biblical writers? Again, we are dealing with mystery. Let’s begin, then, with a lesson in Church history. In the early Church there was a group of people whom scholars call Docetists. These Docetists argued that Jesus Christ, the Son of God, was totally divine and only appeared to be human. Jesus, they said, was like the Greek gods come down to earth disguised as mortals. He looked human but was not really human at all. He was God through and through and only seemed to be human. There was another party in the early Church, the so-called Adoptionists, that took exactly the opposite point of view. The Adoptionists insisted that Jesus was totally human but that He was somehow blessed by God in a special way that set Him apart from everybody else. Many Adoptionists argued that this special blessing occurred at Our Lord’s baptism. When Jesus came up out of the Jordan and the Father declared, “This is my beloved Son,” God was, the Adoptionists claimed, adopting Jesus as His specially chosen servant, and yet, in spite of this, Jesus was a mere human being like you and me. You won’t be surprised to learn that the Church took a dim view of both the Docetists, who argued that Jesus was fully divine and not human, and the Adoptionists, who argued that Jesus was fully human and not divine. According to Catholic teaching, Jesus is true God and true Man. It’s not a matter of either/or but of both/and. Jesus Christ is both fully divine and fully human. Why am I telling you all this? Because what the Church says about Jesus, the Word of God in human flesh, she is also saying about the Bible, the Word of God in human words. Some people look at the Bible the way the Docetists regarded Jesus. They say that the Bible is fully divine, that when God inspired the human authors of scripture, He somehow put them under a trance, or the Holy Spirit literally moved their arms and hands. Other people regard the Bible the way the Adoptionists looked on Jesus. They say that each book of the Bible is a merely human composition on which the Church happened to put her seal of approval. If the Holy Spirit did anything, they argue, He simply kept the human authors from making mistakes. You won’t be surprised when I tell you that, as the Church rejected the teachings of the Docetists and the Adoptionists, she rejects the belief that the Bible is simply a divine work, and she also rejects the notion that Scripture is merely the work of man. As Jesus is both God and Man, so the Bible is somehow both divine and human. Again, it’s not a matter of either/or but of both/and. We cannot say that the Bible is the work of God from start to finish without taking into consideration the human authors. Nor can we say that the Bible is somehow the work of human beings while disregarding the role of God. I repeat: Inspiration is something mysterious. Who can fully explain it? It’s like the way Beethoven, Bach, and Mozart composed their music—a wonder beyond our grasp! I can tell you that the Bible is like Mozart’s music in one key respect. It appears to be simple on the outside, but its underlying riches are so vast that a lifetime of meditation and study won’t plumb its depths. Scripture is, on the one hand, like a wading pool in which a child can safely play. On the other hand, it is like a bottomless ocean that no merely human effort can fathom. It is possible to study the Bible all one’s life and still be struck with new insights. I’ll give you an example from my own recent experience. I was pondering this passage just last week. For years whenever I read these words, I would picture a man turning his back on his father’s funeral, leaving behind a cold corpse—a callous refusal to share in family grief. Why would Jesus call for such behavior? Then suddenly it hit me, as if out of the clear blue. What if the father of the person to whom Jesus is speaking is still very much alive? That changes everything. Maybe what the man is really saying to Jesus is: Sure, Lord, I’ll be your disciple, but let me first receive my family inheritance. Then I’ll follow you. Or maybe the man is saying: No problemo, Lord! I’ll follow you, but let me first wait for Pop to die so I don’t cause him shame or embarrassment. Or perhaps the fellow is simply stating: Lord, I’m not really sure about following you, but let me talk it over with my family first and see what they have to say. Jesus is not telling the man to be heartless. Instead, He’s telling a would-be disciple not to make excuses when it comes to doing the will of God. Money, family prestige, and even fatherly advice are all secondary. I think the message is clear. To be a disciple of Christ is to give Him the Number One place in our lives. The priest Saint John Leonardi was fond of saying, “Christ first of all,” and, “Either Christ or nothing.” Can the Gospel message be any clearer than that? The Bible is not something dead but a living reality. The Mozart effect might bring about positive changes in brain functioning, but the Bible effect can very well bring about beneficial changes in eternal destiny. By all means, play Mozart for your kids, but remember also to expose them to the Scriptures! This homily owes its inspiration, in large part, to a lecture given by Rev. Msgr. Christopher J. Schreck, Rector/President of the Pontifical College Josephinum. Saint John Leonardi died of the plague in Rome on 9 October 1609, having contracted the disease while ministering to the stricken. He was canonized in 1938 by Pope Pius XI.